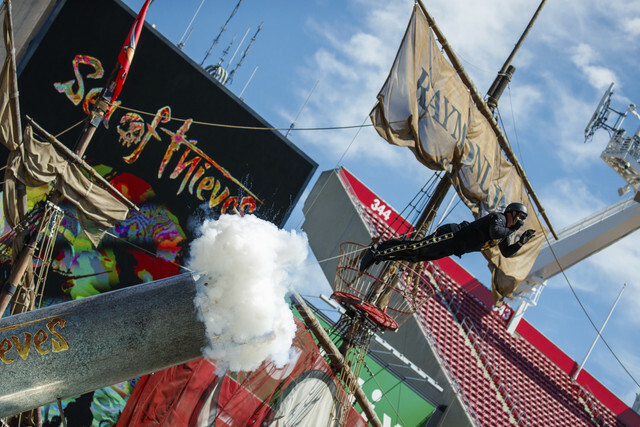 There’s nothing unusual about cannon fire at Raymond James Stadium. Shooting a guy out of a cannon? Unusual. The 34-foot-long cannon reportedly took “The Bullet” from 0 to 60 mph in one-fifth of a second, sending him flying 200 feet and setting a Guinness World Record for longest distance traveled by a human cannonball. Microsoft apparently chose the Buccaneers home stadium for its fitting decor, including a pirate ship with cannons that fire when the team scores. Sea of Thieves gameplay includes players' ability to fire themselves from cannons. The game comes out March 20. Guinness confirmed the new world record on Twitter later Tuesday afternoon.